Antonio Carlos Jobim & Friends: Tribute Concert by Immortal at Public Sounds. Hurry! Limited time offer. Offer valid only while supplies last. NTSC/Region 0. Special concert by Antonio Carlos Jobim and his friends Shirley Horn, Gonzalo Rubalcaba, Joe Henderson, Herbie Hancock and Gal Costa. NTSC/Region 0. Special concert by Antonio Carlos Jobim and his friends Shirley Horn, Gonzalo Rubalcaba, Joe Henderson, Herbie Hancock and Gal Costa. Featuring Ron Carter (bass), Paulo Jobim (guitar), Alex Acuna (percussion) and Harvey Mason (drums). 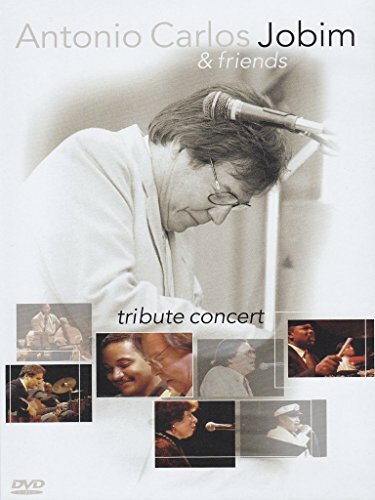 Recorded in Sao Paulo on September 27th, 1993, Jobim and his pals perform ten inspiring tracks including 'Once I Loved', 'Se Todos Fossem Iguias a Voce, Garota de Ipanema' and more. Immortal.